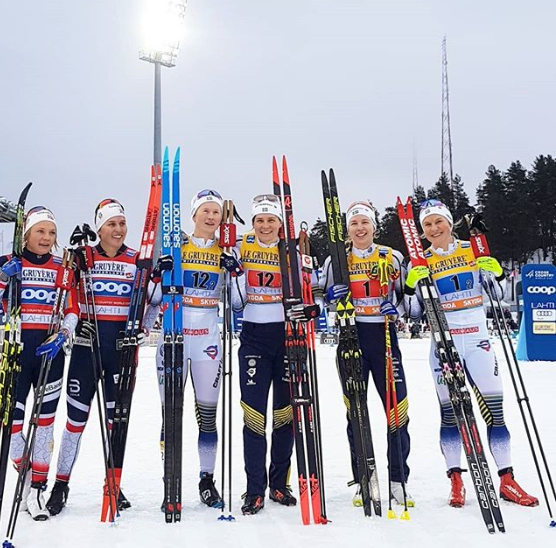 Sunday in Lahti, Finland the women raced a 6 x 1.4-kilometer classic team sprint. U.S. fans saw their hopes for a podium snuffed out in the two semi-finals that determined the 10 teams advancing to the finals. In the first team sprint semi, the U.S. Ski Team’s (USST) Ida Sargent and Sophie Caldwell placed sixth overall and did not advance. Sargent and Caldwell, constituting team USA I, were 10.78 seconds off the winning time of Sweden II’s Evelina Settlin and Hannah Falk, who won the first semifinal in 18:36.74 minutes. In the second semi, USA II’s Kelsey Phinney (SMS T2) and Julia Kern (USST D-Team) raced to seventh (+1:06.32). Norway I’s Tiril Udnes Weng and Maiken Caspersen Falla marked the fastest time of 18:31.09 minutes. In the women’s final, Sweden I’s Ida Ingemarsdotter and Maja Dahlqvist won in 18:24.96 minutes. Weng and Falla took second (+1.84), Sweden II’s Settlin and Falk placed third (+3.55). 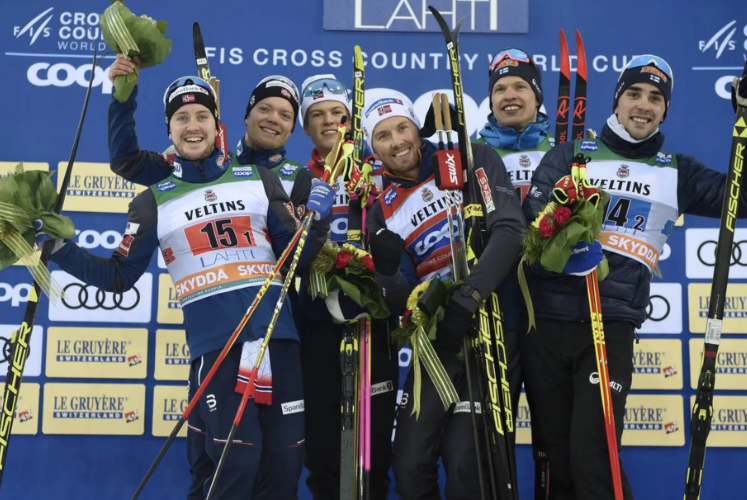 The men raced a 6 x 1.6 k classic team sprint in Lahti. Both U.S. teams entered raced in the second semi with neither placing well enough to advance. The second semi was won by Russia I’s Artem Maltsev and Gleb Retivykh in 19:31.22 minutes. In that semi-final, USA II’s Kevin Bolger and Logan Hanneman placed sixth (+6.60), USA I’s Simi Hamilton and Erik Bjornsen were seventh (+16.05). USA II placed 12th overall, USA I 14th in the final standings. Johannes Høsflot Klæbo and Emil Iversen of Norway won the first semi in 19:22.32 minutes. Norway I’s tandem won the final in 18:57.19 followed closely by Norway II’s Sindre Bjørnestad Skar and Eirik Brandsdal in second (+0.65). It was a photo finish for second and third, as Finland I’s Iivo Niskanen and Ristomatti Hakola finished 0.71 seconds back to take the third podium spot. 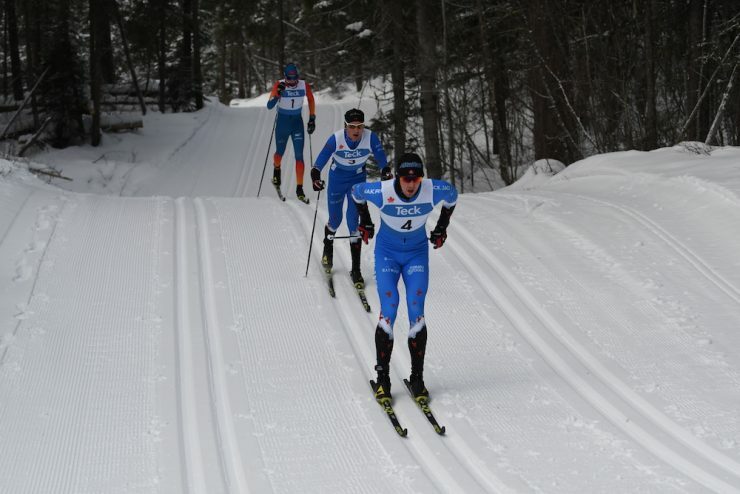 Today’s IBU World Cup sprints in Canmore, Canada have been cancelled due to extreme cold temperatures. Current temperatures in Canmore are -17 degrees Fahrenheit. A temperature reading of -4 degrees Fahrenheit on the coldest part of the course is the minimum for IBU competitions. This race rundown will be updated. Westerns wrapped up with club relays on a day where the thermometer flirted with cancellation before rising to -17C at 9am (that is 2 Fahrenheit, for residents of Liberia, Myanmar, and the USA). The relay event is intended to help build club spirit in a less competitive environment. In practice, many skiers just find two friends they want to ski with. Despite the cold, 105 teams competed today. In the open men category, the ‘BC Lost Boys’ team won easily, with Rémi Drolet, Gareth Williams, and Julien Locke finishing the 15km in 38:00.9. Drolet and Locke are teammates at Black Jack while Williams is a Telemark local. All three are national team members. ‘Alberta 1’ placed second, at 1:47.1 back, with Thomas Manktelow (), Michael MacIsaac-Jones (AWCA), and Sam Hendry (Team R.A.D.) ‘BC Power, Speed, and Grace’ was third, with Tallon Noble (Strathcona), Michael Murdoch (Whistler), and Ian Williams (Telemark) at 2:26.8. The open women used the same 5km loop as the men (and the same as on Saturday). ‘BC Supernovas’ won in 47:25.7, with BC team members Paige Latta (Sovereign Lake), Elizabeth Elliot (AWCA), and Benita Peiffer (Whistler). ‘BC Avalanche’ took second at 1:33.4 with Katie Weaver (RMR), Gina Cinelli (Revelstoke), and Beth Granstrom (AWCA). ‘Just the Ladies – No Nick’ was just 3.5 seconds behind 2nd place with Claire Grall-Johnson (AWCA), Amanda Thompson (AWCA), and Hannah Jirousek (AWCA) representing Yukon/Ontario.